Here are some latest pooja room designs from different parts of India. You can pick some great ideas and tips from them and create a soulful interior for your pooja room. 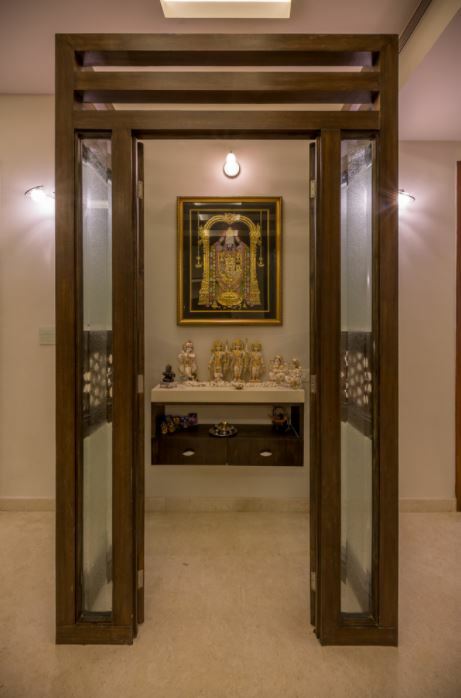 Most of these latest pooja room designs are separate, stand alone pooja ghar. If you have space in your home or apartment then build a small pooja room where you can sit, pray and meditate. 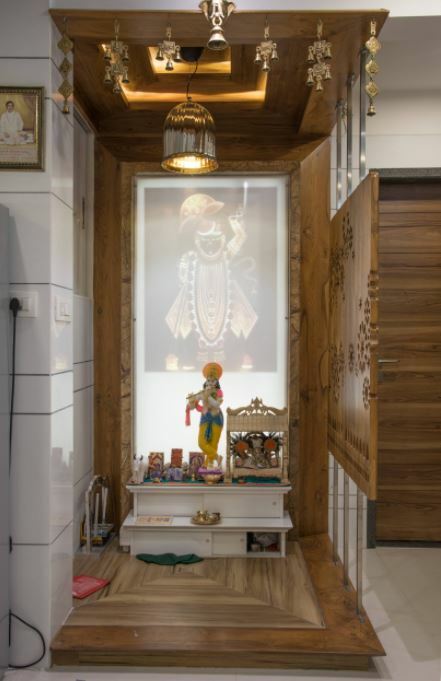 If you have a big hall use wooden partitions like the ones in the above picture to build your pooja room. Place photograph of deities in a small mandir like structure. Do up the room in light yellow and white color. Go for soft lighting to get this look. Use LED lights to give a dramatic look to your pooja room designs. Build a pedestal to keep idol of god and goddess. Add lights behind it to create a magical aura. 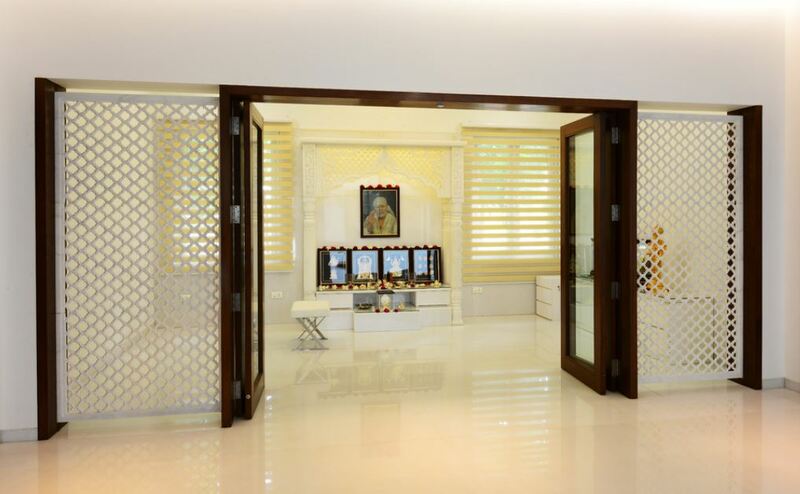 There is a certain amount of calmness about this pooja space which offers a perfect place for meditation. Build a small pooja room in your house. Raise the floor a bit and add a wooden partition to separate it from the rest of the house. I love the ceiling with lights and bells hanging in there. Go for a two step platform to keep your deities. The steps have sliding doors with storage inside. 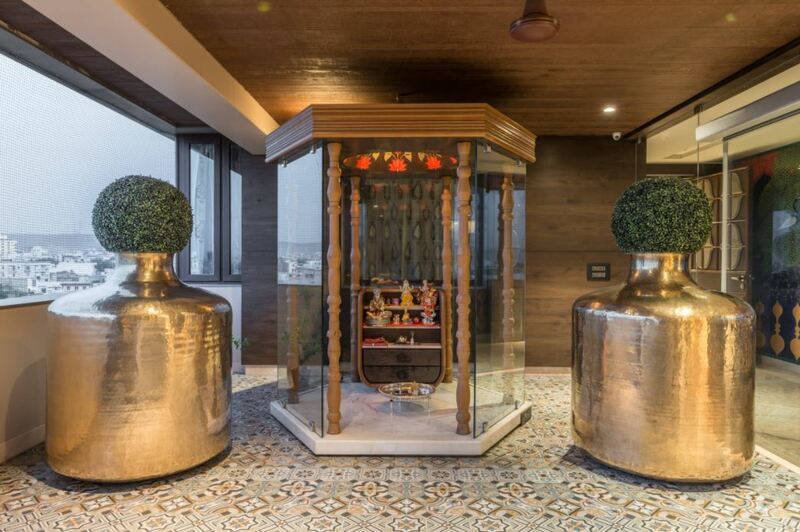 This amazing glass pooja room stands between the living room and the dining hall. Add a floating shelf with a couple of drawers for storage. Place idol of your deity on it and hang photographs if any on the wall. This pooja room has a creative ceiling. It has a backlit floral pattern that is reflecting on the walls. Go for glass doors with brass Om shaped handles. The room has some storage area beneath the stone countertop wherein you can store all your pooja essentials. 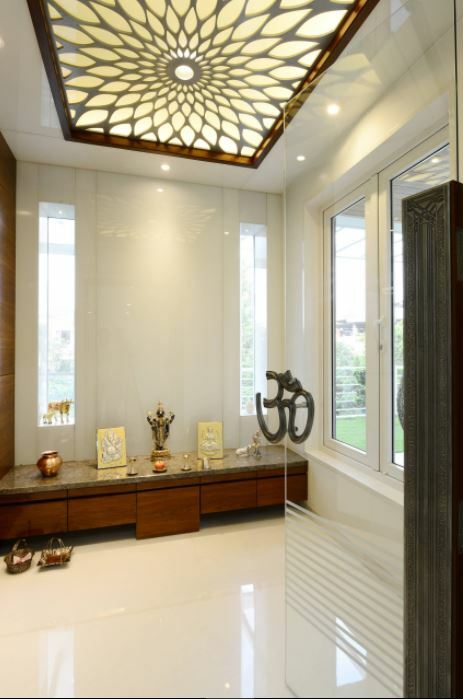 Go for this simple pooja room design in glass. You can get a clear view of pooja room from the living room; it can keep you connected with the almighty at all times. Here is a pooja room with lots of greenery. 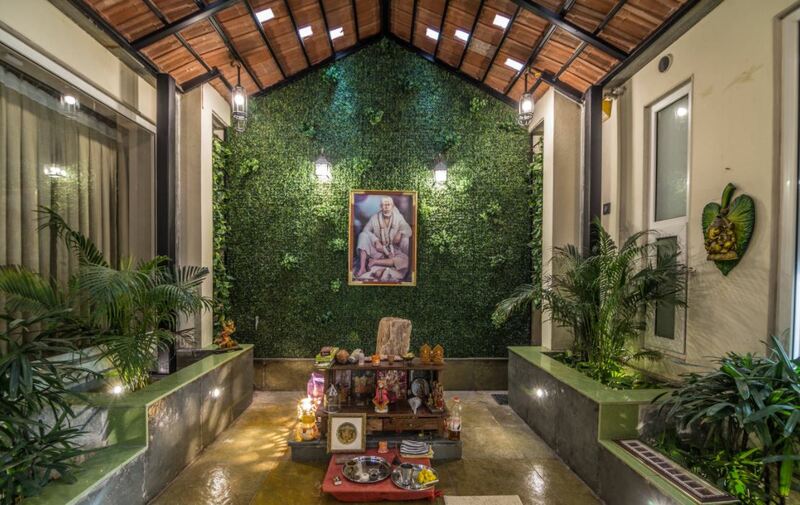 I love the wall with vertical garden and Sai Baba’s photo on it. It is a great place to sit and do pooja every day. 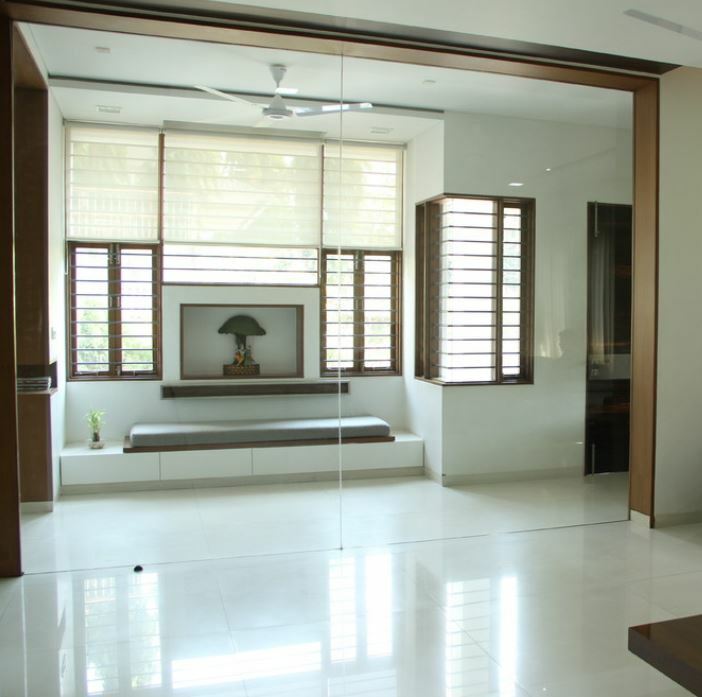 This is a spacious pooja room with a view as one side has glass windows. It has two large brass urns with boxwood ball on top. 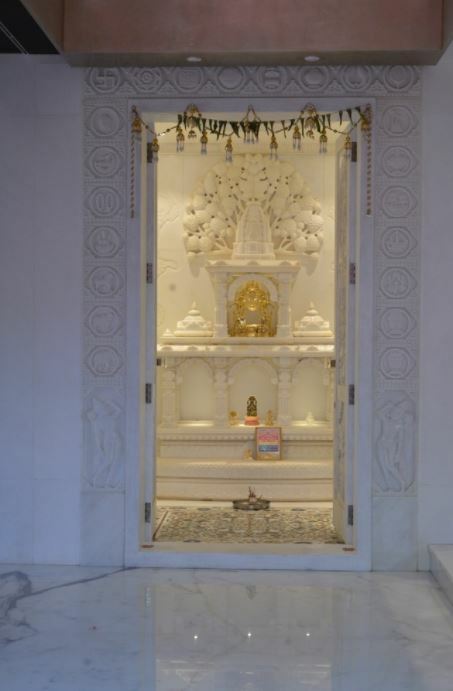 Deities are placed in a separate glass mandir. Go for a nice patterned floor to recreate this look in your house. Check out this beautiful marble pooja room. There are some intricate carvings at the entrance. 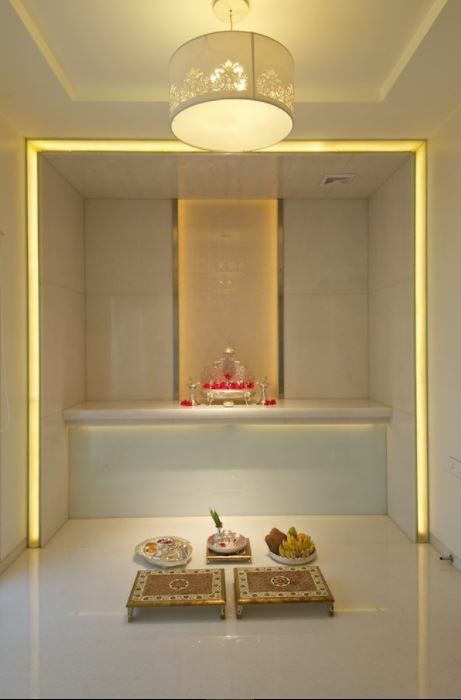 A mini temple is made along the wall of this white pooja room. Place idol of gods and goddesses in it. 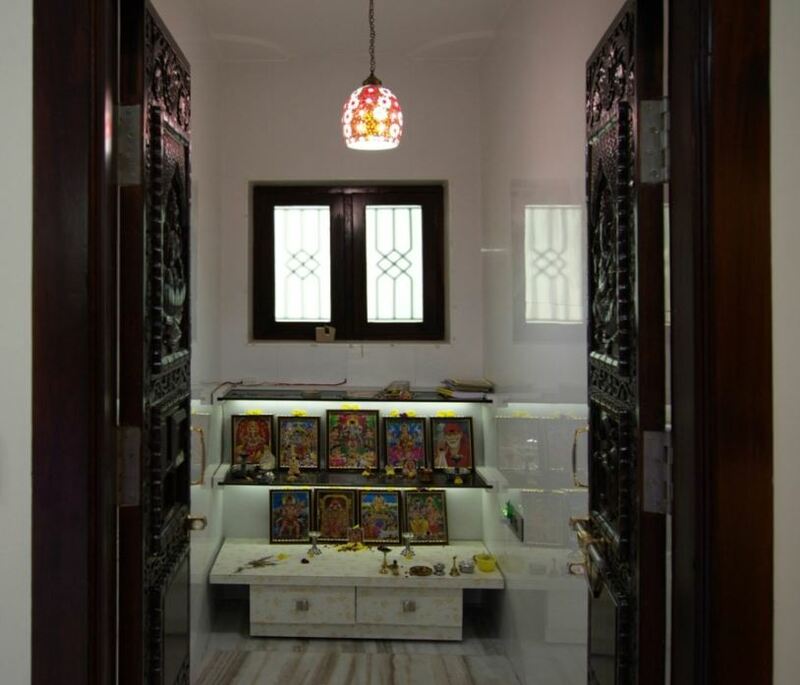 This is a typical pooja room with carved wooden doors and marble flooring. The small window at the back allows light and air into the room. Build a couple of shelves to keep the idols and photographs of your deity on it. I love the under shelf lighting in here. This entry was posted in Pooja Room, Pooja Room Designs and tagged Indian Pooja Room Designs, Latest Pooja Room Designs, Latest Pooja Room Designs for Indian Homes, Modern Pooja Room Designs, Pooja Ghar Designs for Indian Homes, Pooja Room, Pooja Room Design, Pooja Room Designs, Pooja Room Designs for Homes, Pooja Room Designs for Indian Homes, Pooja Room Designs for Living Room, Pooja Room Designs in Glass, Pooja Room Designs in Hall, Pooja Room Designs in Wood, Pooja Room Ideas, Pooja Room Interior Designs, Simple Pooja Room Designs by Homemakeover. Bookmark the permalink.